The second budget presented the Kumaraswamy-led state government shows that the social sector (education, family, housing, medical and public health, etc.) has seen a dip in the government’s expenditure. On February 8, 2019, Karnataka Chief Minister H D Kumaraswamy presented his government’s second budget. The total budget of the government for the fiscal year 2019-2020 is Rs. 2,21,685 crore. For the previous fiscal year 2018-19, the budget was Rs. 2,18,488 crore. The Congress-JD(S) coalition government has been under a constant attack from the Bharatiya Janata Party (BJP) in the state with the saffron party claiming that the government is not dedicated to development work and is making false promises. The state government has been time and again complaining about the lack of funds due to the central government’s failure to release funds required to successfully carry on the projects. Following is the percentage of expenditure of the state government in general, social and economic sectors for the last three years. As seen above, the allocation in the general sector (police, jails, public services, administrative services, etc.) is increasing. While the previous government in its last budget for the year 2017-2018 allocated just 20.5 per cent for this sector, the current government increased it to 22.5 per cent and 23.2 per cent for FY 2018-2019 and 2019-2020, respectively. On the other hand, the social sector (education, family, housing, medical and public health, etc.) has seen a dip in the government’s expenditure. While the former government had allocated 38.9 per cent for the sector, the current government had marginally increased it to 39.0 per cent for 2018-2019 and has reduced it to 37.7 per cent for the current fiscal year. In the economic sector (agriculture, irrigation, animal husbandry, etc.) though the allocation made for the current year is lower than what was made by the previous government, it is marginally higher than its allocation for 2018-2019. The previous government had allocated 36.9 per cent for 2016-2017, the current government allocated 35.5 per cent and 35.9 per cent for 2018-2019 and 2019-2020, respectively. 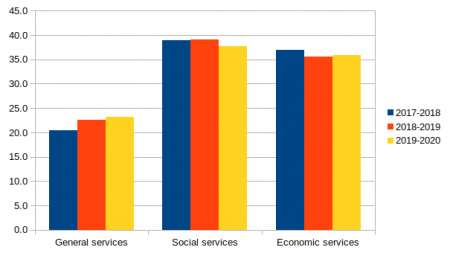 The allocations made in the social sector is much lower than what is expected of a government. The current coalition government in the state is in a hostile relationship with the BJP-led central government. How would a state government without the help of the central government ensure that the development projects are carried out? For a government that claims its vision is the development of agricultural sector and farmers, a minimal increase in the economic sector raises questions about how would they go about their projects. In its first budget in July 2018, this government had announced a farm loan waiver scheme. But this loan waiver scheme proposed to waive loans in phases. In the newly launched scheme, however, the CM has announced waivers amounting to Rs. 34,000 crore, while the total farm loans amount to around Rs. 1.20 lakh crore. In the current budget, the CM has said, the scheme would be continued. The expenditure of the government on agriculture, for the fiscal year 2019-2020, as shown in table 1, has marginally reduced as compared to its expenditure the previous year and the year before that. Out of Rs. 2,21,000 crore of the total state budget, Rs. 5,38,000 lakh has been allocated solely for agriculture. Apart from this allocation, the government has also announced various new schemes for agriculture and horticulture. For this sector, 2.4 per cent of the total budget is allocated, which is lower than the previous year which was 2.6 per cent of the total budget. In 2017-2018, however, the Congress government had allocated 2.9 per cent of its total budget. We should note that, even though the current government had announced the farm loan waiver, only 60 per cent of the farmers have gotten their loans waived off as promised by the government and the remaining are in the stage of paperwork, as Veerasangaiah of Karnataka Rajya Raitha Sangha had told NewsClick. This marginal decrease in the allocation for the sector is due to the schemes announced by the government for the sector and separate allocations made for them. For example, the government has released Rs. 5,000 crore for farm loan waivers and has allocated Rs. 12,500 crore for the scheme. The government is investing Rs. 15,000 crore in Israeli agriculture technology, while Rs. 350 crore has been allocated for the state’s Krushi Bhagya scheme. Under the Krishi Bhagya scheme, the emphasis is on helping farmers take up water conservation measures such as constructing farm ponds in their agriculture land and saving every drop of rainwater for use during dry spells to protect standing crops. The state government is not happy with the “Pradhanamantri Fasal Bima Yojana”, a crop insurance scheme of the central government. The state government has accused the scheme to be in the interest of the insurance companies and announced that they will design their own insurance scheme soon. To encourage the farmers of the commercial crops, the government has announced a new scheme called, “Raita Siri.” Under this scheme, these farmers will receive Rs. 10,000 honorarium and the government has allocated Rs. 10,000 crore for this scheme. The government has also started a new loan scheme for a small farmers, called “Gruha Lakshmi Crop Loan” and under this scheme, the farmer gets a loan with 3 per cent interest on gold. Table 2 shows the allocation made by the state government in education in the years 2018-2019 and 2019-2020, and the allocation by the previous government in 2017-2018. First, the government has allocated Rs. 25,08,702 lakh out of Rs. 2,21,685 crore for the current fiscal year; i.e. the expenditure on education is 11.3 percent which is lesser than what it was last year. However, it should be noted that the total allocation by the government on education last year was just 10.9 per cent but their expenditure was more than the allocation. Data shows that expenditure in the education sector by the state of Karnataka is gradually decreasing. It was 17.7 per cent for the year 2000-2001 and has been decreasing ever since. The allocations made for the year 2000-2001 was almost the same as the average allocation for education in all states - which was 17.4 per cent. In the fiscal year of 2016-2017, the all-state average allocation was 15.6 per cent and the state had allocated 12.7 per cent. As shown in table 1, the allocation saw a decrease in the following year. Table 3 shows the allocations made by the government in the Medical and Public Health sector. It has allocated mere Rs. 7,43,528.24 lakh out of Rs. 2,21,685 crore, i.e., a mere 3.4 per cent of the total budget is allocated for health. It is less than what it spent last year- 3.6 per cent while the allocation was 3.20 per cent. It is also much less than what was allocated by the previous government in 2017-2018. As in the case of the education sector, the allocation for the Medical and Public Health sector has declined over the years. In the year 2016-2017, the state had allocated 4.1 per cent of the total budget for the sector; however, as seen in Table 2 there is a sharp decline the following year. The data shows the decline since 2001. For the year 2000-2001, the allocation in the state budget was 5.1 per cent higher than the all-state average expenditure for Medical and Public Health, which was 4.6 per cent. One can see that the state’s allocation has usually been at par with the all-state average expenditure in the health sector. However, this has changed now. For the year 2016-2017, the all-state average expenditure was 4.9 per cent, while for 2017-2018, the state allocated 3.5 percent. The state is recorded to be doing good in its health sector. Karnataka is one of the first Indian states to put a state health policy in place (2004). It has also been a pioneer in government supported health insurance schemes, with Yashaswini (2002) and Vajpayee Aarogyasri (2010) among the first initiatives in India. However, in the graph above, Karnataka Integrated Public Health Policy(2017) shows the stagnation in the state expenditure on public health. According to the Karnataka government’s data in the Economic Survey of Karnataka (2017-18), the stagnation in funds has adversely affected the functioning of the public health facilities. Few days before the budget, the local media had reported that the CM has decided to withdraw from Ayushman Bharat scheme and now the government is clubbing Arogya Karnataka scheme with Ayushman Bharat. In March 2018, the former state government in Karnataka led by Siddaramaiah had launched Arogya Karnataka Yojane to ensure that primary, secondary and tertiary medication is accessible to each one in the state. Yeshaswini scheme, along with Vajpayee Arogyashree Scheme, Rajiv Arogya Bhagya Scheme, Rashtriya Swasthaya Bima Yojana (RSBY) including senior citizens, Rashtriya Bala Swasthaya Karyakram (RBSK), Mukhyamantri Santwana Harish Scheme and Indira Suraksha Yojane, was subsumed into the Arogya Karnataka Yojane. This universal health coverage for residents of Karnataka excluded the residents who have purchased private health insurance policies on their own, and also those covered under Central Government Health Scheme of the Government of India. The current budget of the coalition government is as bad as what the BJP is claiming it to be. One has to wait to see how would the political climate in the state let the state government function and keep up the promises made in this budget.